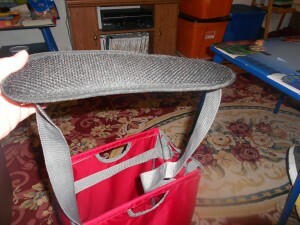 I received an ADK Packworks Tote, shoulder strap and the topper free of charge for my review. All opinions are my own. 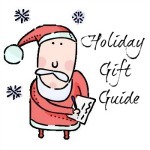 It is that time of year again to start thinking about holiday gifts. Coming up with a unique yet useable gift for some of the people on your list can be a daunting task. I know of a few people on my list that are so hard to buy for and it really never seems to get any easier. ADK Packworks has just made your job easier if you happen to be shopping for a mom on the go or any busy woman that can use just a little bit of extra help getting her stuff from point A to point B. ADK Packworks offers fashionable and innovative totes that can be used for almost anything you can imagine. 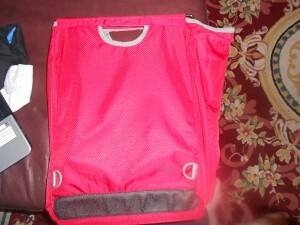 The tote includes and internal frame and flat bottom for increased stability. You can easily use your tote for groceries, a day at the beach, and day at the park or simply just to hold your kids extra accessories in the car. The tote also offers 3 different ways that you can carry it. 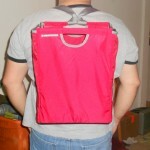 You can carry your tote with two handles, over your shoulder or as a back pack. You just simply reconfigure the straps that suits your style or preference. I chose the red bag for review and absolutely love the color! 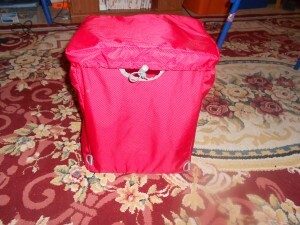 When the tote is not not being used it also folds up nicely for easy storage. It is fantastic! I have had my ADK Packworks tote for quite a while now and absolutely love it. I live on the 3rd floor of an apartment building so to say the least getting groceries up the stairs can be quite difficult especially when the plastic bags bust. The tote is big enough to fit quite a few groceries inside. 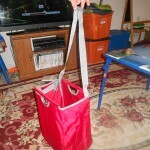 I like using the shoulder strap when I am transporting groceries up the stairs. I also love using my tote in the car to hold all of Little C’s extra stuff that he likes to carry along with him. It all depends on where we are going as to what he likes to bring along. It will be even more helpful with the winter months coming up because he will be able to put his jacket in the tote and it won’t end up getting stepped on in the floor of the car. I am also very close to having baby #2 and he will obviously need extra stuff in the car. We will of course have his diaper bag with us, but I will be putting stuff in the tote that Little C will be able to get for him. It will keep Little C out of the diaper bag and create less of a mess in the car. Little C doesn’t play any sports just yet, but I think the tote would be perfect for taking out to the baseball or soccer field for games, especially if you purchase the cooler liner that is available from ADK Packworks. It will also be nice to be able to take on vacations! 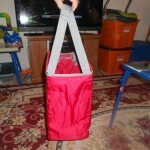 If you are shopping for a busy on the go mom make sure to check out ADK Packworks. I believe that she will love the tote and find many different uses for it. As you shop around this holiday season make sure to check ADK Packworks out! You can also find them on Facebook and Twitter! I love a good tote! This one looks really handy for carrying big loads. You can never have too many reusable grocery bags. What a cool tote! I could really use something like this. This is interesting. I had not heard of the product before. Thanks for sharing. I love how the straps can be worn a few different ways!